Microsoft Outlook is one of the best Email clients ever. I have email accounts with Gmail, Yahoo, Hotmail, my school Email and then finally work email. It would be a huge waste of time if I were to log into each one of those web based email services in order to check my Email. So I just bring all of them into my Outlook. If you are like me and maybe wished to categorize emails based on the sender such as identifying them using a different color for a unique sender such as a Red for my manager, a pleasant pink for email from my boyfriend etc. Here, follow the methods outlined below in order to display your emails using a different color depending on the sender of the Email. Step # 2: In the Ways to Organize Inbox section, choose Using Colors. Here, you will find options to color messages for either incoming email messages(from) or outgoing email messages(sent to). In order to select a particular sender, just click on an email from them. Here I want to choose a color for all my FaceBook messages. So I just click on an email from FaceBook and Outlook fills out the from section for me. 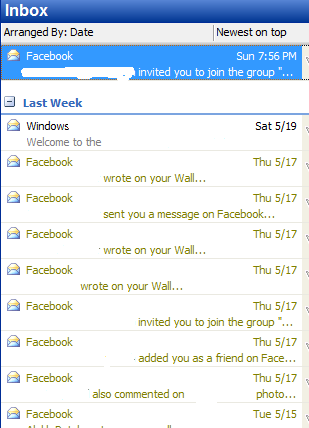 I then choose a color and click on Apply Color and that particular color is applied to all my emails from Facebook. Step # 3: You can also categorize emails by color using an individual email Id too. Here, I choose [email protected] and flag it with Red color. I can choose from a list of 16 colors. Step # 4: If you wish to further customize, you can also change the font size, the style and size of an email from a particular sender. Select Automatic Formating Box at the top right corner. Here you can select various customizations. 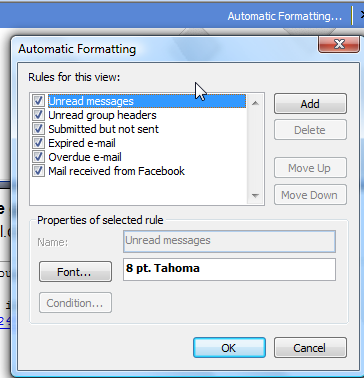 You can set rules for Incoming messages, Submitted emails but not sent, Expired Email, Overdue email etc.